We had a good trip to Milton, where we met our son and 2 grandkids from Scarborough. Extremely satisfied. I honestly did not expect this level of cleanliness. An excellent place for short stays during a transient. The shuttle service was also convenient. Where to find Milton hotels near an airport? Where can I find hotels in Milton that are near tourist attractions? If you plan to stay near the center of Milton, there are several accommodations. 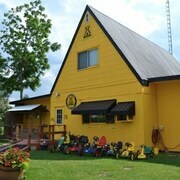 About 5 Expedia-listed accommodations are within a 0.1-kilometre (0.06-mile) distance of Milton's center. Some hotels that are close to the heart of Milton are the Holiday Inn Express & Suites Milton and Best Western Plus Milton. 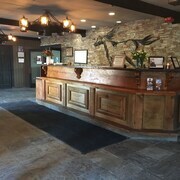 One of the small number of economical hotel choices in Milton is the Mohawk Inn and Conference Centre. The Homewood Suites by Hilton Hamilton, Ontario, Canada is located 30 kilometres (19 miles) away from the center of Milton. 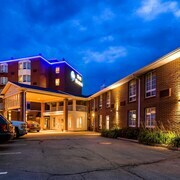 Another option is the Homewood Suites by Hilton Burlington, which is situated 20 kilometres (13 miles) away. Another possibility is to investigate the Residence Inn by Marriott Toronto Mississauga/Meadowvale or the Staybridge Suites Oakville. Time permitting, you could travel to other places in the Southern Ontario region. Check out Southern Ontario's traditional villages and churches. Nature lovers could also take the time to to enjoy the region's beaches, coastal plains and forests. Fun-loving visitors may try their hand at skiing here. Looking for more things to do? Why not spend a few hours visiting Knox Presbyterian Church and Provincial Legislature, which you'll find in University District, 45 kilometres (29 miles) to the east of Milton. The The Ritz-Carlton, Toronto and Four Seasons Hotel Toronto are just some of the great hotel and apartment alternatives in University District. Alternatively, you could consider staying at Downtown Toronto, 45 kilometres (29 miles) to the east of Milton, where you can choose from the The Hazelton Hotel Toronto and Windsor Arms Hotel. The Church of the Holy Trinity and Mackenzie House are popular attractions to check out when visiting Downtown Toronto. Just because you're traveling, doesn't mean you can't enjoy your love of sports. Air Canada Centre is situated 50 kilometres (30 miles) to the east of Milton. Sports fans wishing to find accommodation close by can choose from the Shangri-la hotel Toronto or the Trump International Hotel & Tower Toronto. Pearson International Airport is a nearby airport, and is 30 kilometres (20 miles) from Milton. 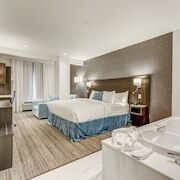 Conveniently located Expedia-listed hotels include Sheraton Gateway Hotel In Toronto International Airport and Residence Inn by Marriott Toronto Airport. What are the most popular Milton hotels? Are there hotels in other cities near Milton? What other types of accommodations are available in Milton? Explore Milton with Expedia.ca’s Travel Guides to find the best flights, cars, holiday packages and more!